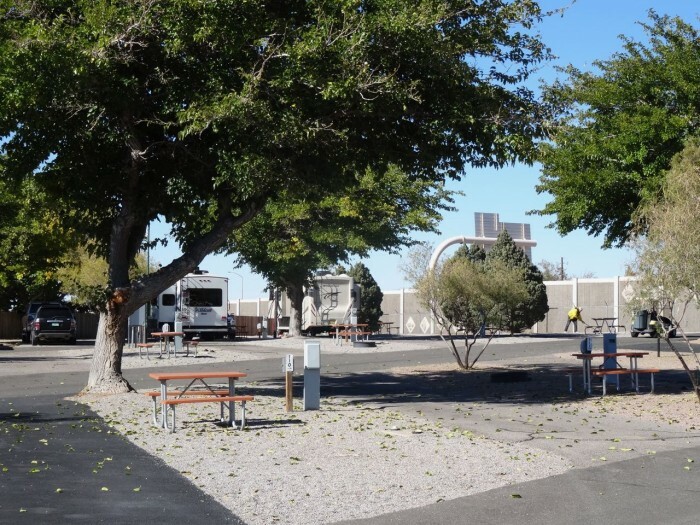 This is an older RV park and, while clean, is not at all beautiful. The pull through area in which we stayed is a large gravel area, a gravel parking lot with utility hookups for 14 campsites. The wifi is adequate. We had room to park our motorhome with the tow car behind with no problem. The interior roads will accommodate a large motorhome with no difficulty. We camped at Big Texan RV Ranch (formerly Amarillo Ranch RV Park) in a Motorhome. Be sure to get off I-40 at exit 74. Our GPS took us off at exit 73 and we had to navigate a neighborhood and go past a closed entry road before finding the park entrance. This park is convenient to I-40. Checkin was efficient and the staff were helpful in getting us in. The interior roads are wide enough and the pull through site that we used was plenty long for our 45-foot motorhome and car. The park is well maintained, neat and clean. We camped at Albuquerque Central KOA in a Motorhome. Easy access from HWY 305, the road from Poulsbo to Bainbridge Island. 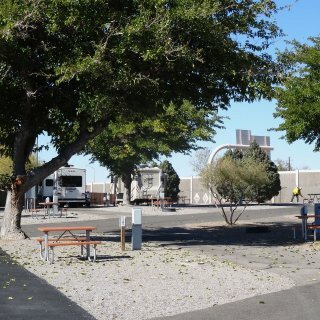 The campground has a wide central road with campsites on each side and parking for the tow car in front of the RV. The utilities are well placed and work well. The campground is neat and clean. We found the staff to be helpful and friendly. We camped at Cedar Glen RV in a Motorhome. Central Market is a wonderful grocery store, 2 miles away. The ferry dock on Bainbridge Island is 8.4 miles away. This campground is neat and clean. The staff are friendly. The wifi is poor in the middle of the night and nonexistent in the evening. The roads and sites are newly paved, but the sites are quite unlevel from side to side. While the sites are plenty long, they are very narrow. 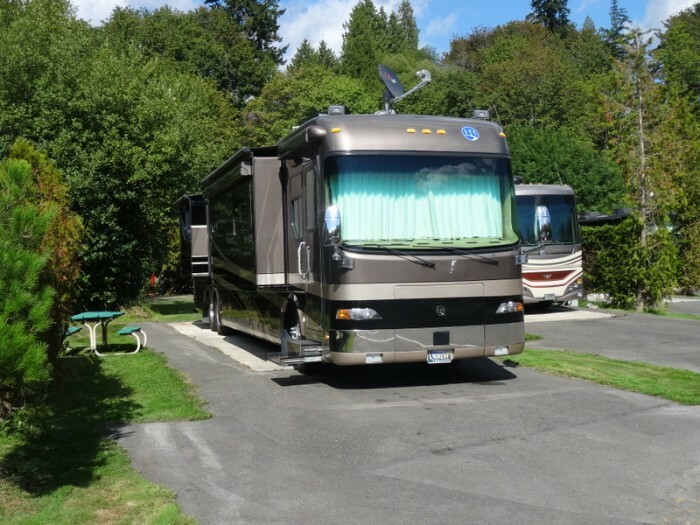 It is almost impossible to get a big motorhome into the site because these narrow sites have bushes at each corner, making it difficult to turn into or out of the site. We camped at Devil's Lake RV Park in a Motorhome. This is a great campground for an overnight stay when traveling along I-5 in Oregon. The sites are level concrete pads and the roads are asphalt. There is a picnic table at each site and the wifi worked fine. The office is only open limited hours. Call ahead and they will put out your map. The roads are a bit cramped for a big motorhome, but OK if you drive carefully. 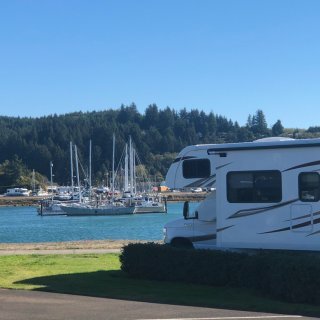 We camped at Tri City RV Park in a Motorhome. This is a small park near the bridge over the Columbia River. It is neat and clean. The campsites are paved with strips of grass in between. The utilities worked well and we had adequate wifi. The park staff was helpful and friendly. The roads are narrow and turns are tight but we had no trouble with a big motorhome. 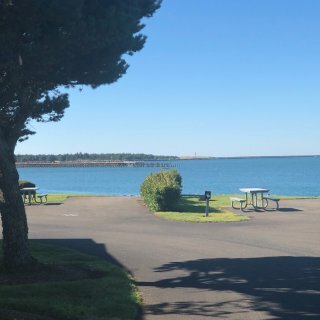 We camped at Bridge RV Park & Campground in a Motorhome. There is a lot to do in Hood River, just across the river. We enjoyed driving the Fruit Loop, a route through the orchards south of town. This park is set in a beautiful woods along the river bank. The roads are easily navigated even with a large motorhome. The campsites are long enough and there is plenty of space between the campsites. The park is well maintained. The hookups are good. The wifi works well. 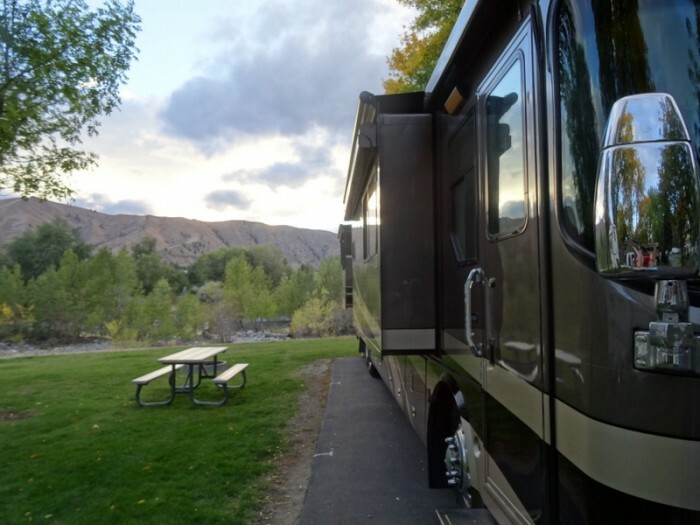 We camped at Wenatchee River County Park in a Motorhome. This park is next door to a huge outlet mall. The campground is neat and clean but quite crowded. 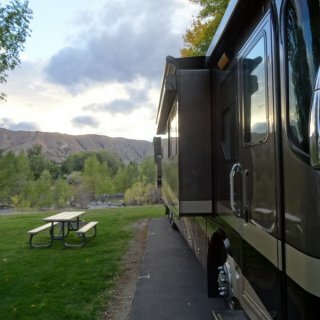 The roads are easy to navigate, even with a large motorhome and the campsites are long enough for a 45 footer and car. There is only a small strip of grass between parking spots. It feels a bit like a parking lot. We would stay here again as it is convenient to the Portland area. 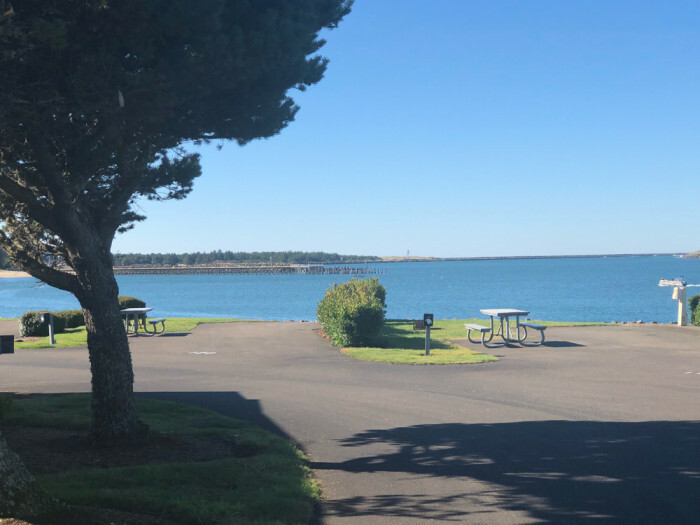 We camped at Portland-Woodburn RV Park in a Motorhome. Several restaurants are within walking distance from the campground. We have stayed at this park on several occasions. It is convenient to the Seattle area and yet is in a nice natural area around a lake. The staff are friendly and helpful. The campground is neat and clean and well maintained. We camped at Lake Pleasant RV Park in a Motorhome. The staff are friendly and helpful. The campground is clean and well maintained. We drive a big RV and barely had room for ours and toad on the site. The sites are narrow and close together, but the road is wide enough that it was not hard to back into our site. The WiFi works well. 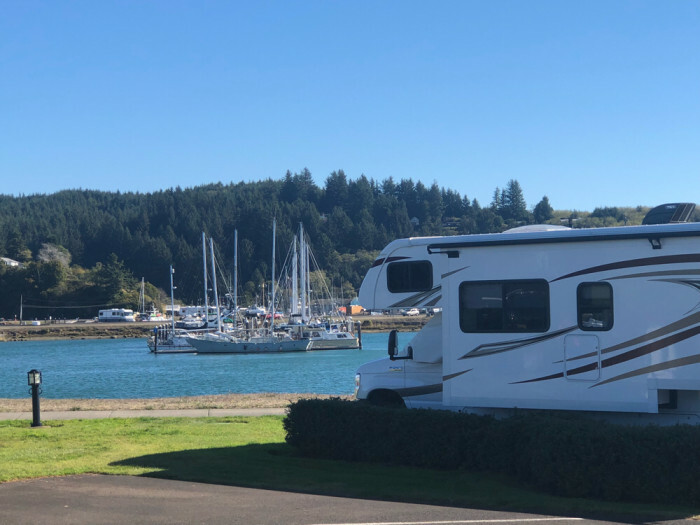 We camped at Premier RV Resort of Lincoln City Oregon in a Motorhome. This campground must be considered a city campground. It is convenient to travel into San Francisco but it is also quite compact. We traveled to the city by bus on one day and by ferry on the next. The staff are excellent in assisting with navigation of the public transportation into the city. The campsites are gravel, level and close together. We camped at Marin Park in a Motorhome. A 15 minute walk will get you to the bus stop for a ride into San Francisco or to the dock for a ferry ride to the San Francisco waterfront. Good shopping in the mall or grocery stores is close to the campground. This campground is located in Coburg, OR which has been a center for RV manufacturing and service. We stayed here for several days while getting work done on our motorhome. Premier is safe and clean as well as convenient. Our only problem was that the Wifi is poor. 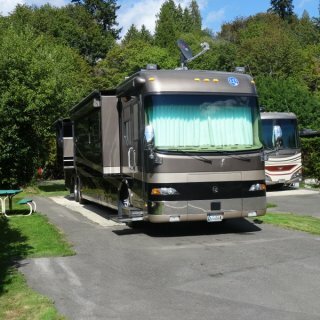 We camped at Premier RV Resorts of Eugene Oregon in a Motorhome. Brookhollow is a pleasant, well-maintained older park where we stayed overnight. The camp host met us as we arrived after the office closed and he was friendly and helpful in getting us to our site. We will stay here again. We camped at Brookhollow RV Park in a Motorhome.